The heart is an eye, writes Nobel laureate Octavio Paz in an essay on Mattas paintings. Matta creates a world coloured both by a sunny faith in the future and by visions of impending doom. Roberto Sebastian Echaurren Antonio Matta, who died aged 91 on 23 November 2002, was born in Santiago, Chile, on 11 November 1911 into a family with Spanish, French and Basque roots, and raised in an atmosphere of religiosity. By the age of 21 he had graduated and begun work as an architect, but his leisure time he devoted to sketching and painting. 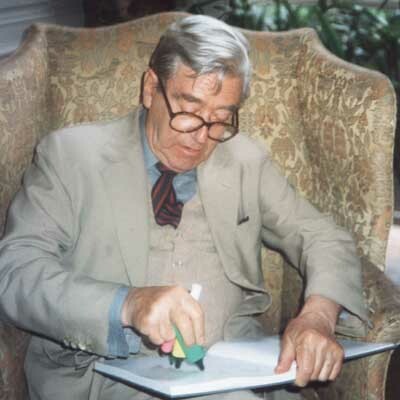 In 1933 he travelled to Europe for the first time, visiting Greece, Yugoslavia, Italy and other countries, and subsequently taking the initiative to collaborate with the architect, Le Corbusier. As time passed, however, Mattas enthusiasm for a career in architecture waned, and he began to devote himself full-time to art, making early acquaintances with surrealists such as Max Ernst, Salvador Dalí, André Breton and others. Between 1939 and 1948 Matta, like many of his artistic contemporaries, lived in self-imposed exile in the USA, but, after almost 10 years absence from Europe, he returned to make first Rome and then, a few years later, Paris his home. Throughout most of the rest of his life Matta commuted between his studio in Paris and his creative refuge in the monastery outside Rome. And it is here, in Italy, that he produced his greatest paintings. Mattas first retrospective in Sweden was organised in 1956 when his works were exhibited in what was then Galerie Colibri  run by, among others, the artist C O Hultén at number 36 Södra Förstadsgatan in Malmö, Sweden. This was also the time when Matta began to collaborate with poets and other artists in Sweden. He produced the illustrations for Lasse Söderbergs first anthology of poems, Akrobaterna (The Acrobats), published in 1955, and was also responsible for the cover of the Swedish art and literary magazine Salamander. In 1959 the first museum exhibition of Mattas work in Europe was arranged at the Museum of Modern Art (Moderna Museet) in Stockholm. Held under the aegis of Pontus Hultén, it was entitled Fifteen Forms of Doubt and included 15 or so gigantic paintings and about 3 dozen drawings. Today Matta is represented in virtually all world-class museums. Siwert Bergström first contacted Matta in Paris in 1976, visiting him in his studio there and later at his home in Rome. The outcome of the meetings was an exhibition at Galleri Kända Målare in Jönköping, Sweden, later the same year. In 1988 several of Mattas works were shown at Galleri GKM in Malmö, and in conjunction with this exhibition the gallery published a book on Matta with texts by Octavio Paz, including the prose poem The Heart is an Eye. The book also contains contributions by Lasse Söderberg, Ingemar Leckius and text fragments penned by Matta himself, one of which is his prose poem The Earth is a Man. In the autumn of 1991 Galleri GKM organised a second Matta exhibition at which five omnibus volumes of engravings were shown in their entirety for the very first time. The ambiguity of Mattas motifs owes much to the fact that the multiplicity of their abstraction is occasionally tempered by an exactness reminiscent of the unerring precision of satellite photographs. The paintings are often peopled by hybrid figures  half-human, half-alien  and harbour an explosive power  a volcanic energy and forward momentum that possesses the ability to engender simultaneous sensations of both delight and despair. 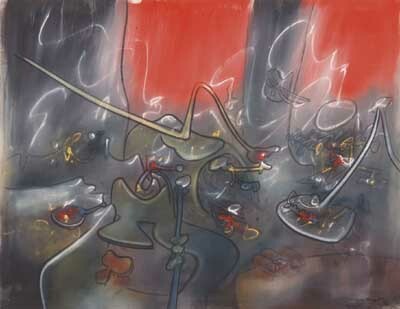 Matta is the true surrealist who passionately portrays an inner and external reality. He himself explained that he wanted to capture the invisible, the intangible. Drastic visions of the future melt into memories of the past. Great chunks of colour, black as night, are mixed with moss greens and luminous palettes of lemon yellow, as melancholy and the malignantly destructive are married on his canvases with more idyllic impulses and impressions that celebrate the wonder of life. The result is paintings that embody both a sense of joy and a vision of fear.